The 90's, a decade that doesn't really have the best reputation when it comes to horror films. That doesn't mean there wasn't a few gems though, "Event Horizon" is one of those gems. Writer Philip Eisner wrote the movie after a family tragedy, in an effort to force himself to get back to work he pitched the idea of "The Shining in space" to the studio, who were very receptive. The subject matter blended with his emotional state to inspire a prolonged bout of writer's block. The studio executive who had originally brought him on board helped keep Eisner on track. The casting for the film was fantastic, Laurence Fishburne puts in the type of solid performance we're used to seeing from him. Sam Neill, well he just blows me away. He always seems to take a character and make it his own, he brings so much to each role he plays and it never ceases to amaze me. Director Paul W.S. Anderson's initial cut of the film ran over 130 minutes and was graphically violent, so much so that both test audiences and the studio baulked at the finished product. Paramount ordered him to cut the film by 30 minutes and tone down some of the violence, a decision he has stated now regrets. We can only imagine what it was like. The film also has one of my most favourite scenes, known as the "Visions From Hell" sequence, it grips me every-time I see it. The cinematography of the film is absolutely outstanding and it has aged really well. 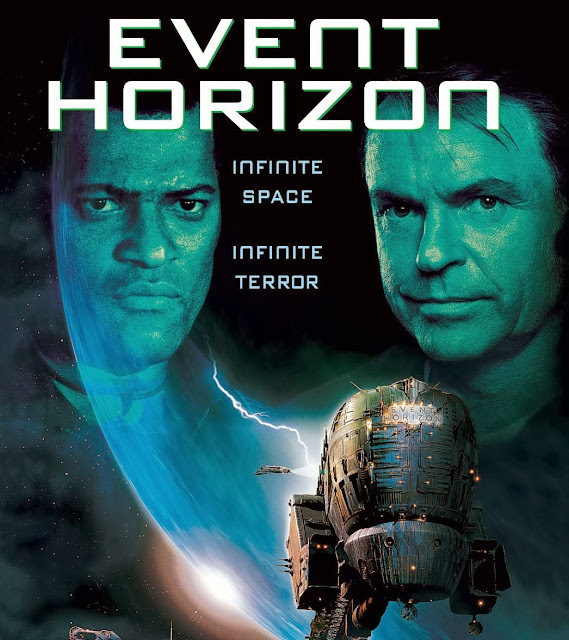 "Event Horizon" is a film you must see, it's one of my personal favourites that I always highly recommend. This movie was produced entirely within the UK, even the special effects. The script originally described the Gateway machine as a smooth and featureless black orb suspended in midair between large, rotating mechanical arms. It also was said to contain a stable black hole within it at all times (which the ship used as a power source), as opposed to briefly creating a temporary one. Paul Anderson decided to redesign it to involve interlocking circles as a homage to the puzzle box in Hellraiser, which served as an inspiration. Director Paul W.S. Anderson was forced to cut over 20 minutes of violent scenes so the film could reach the R-rating. According to the DVD documentary, the first cut of the film had a longer "Visions from Hell" sequence, more blood, and a different, though similar, ending. The test audience didn't like it, so it was re-cut with an alternate ending involving what director Paul W.S. Anderson called "The Burning Man Sequence." The second test audience didn't like that version, and the film was edited again. The final cut is a less-intense hybrid of both test screenings, with significantly less gore. Jeremy Irons and Amy Brenneman were originally set to star in the film. Clive Barker consulted on the project during pre-production. The space suits worn by the actors weighed 65 pounds (30 kilograms) each. Laurence Fishburne nicknamed his "Doris." Due to the weight, standing upright in them for longer periods could lead to back injury, but sitting down was not possible either due to the backpack. Special "hanging poles" were constructed on the set, so the actors could rest on them between takes. The Event Horizon was modelled on Notre Dame cathedral. Its long corridor resembles a church nave, and its interior is filled with cruciform shapes, columns and vaults. Also, its engines resemble rotated church towers. The Event Horizon was named after the theoretical boundary surrounding a black hole, within which gravitational attraction is so great that nothing, not even radiation, can escape because the escape velocity is greater than the speed of light. Technically, it is where the physical universe ends and physical laws no longer apply. So the ship's name is symbolic for its journey beyond the borders of the known universe. Director Paul W.S. Anderson and producer Jeremy Bolt planned to put together a director's cut for some time, but most of the footage was lost or destroyed after post-production. A few of those scenes, which appear on the Special Collector's Edition DVD, survived only in videotape form, sometimes without dialogue or sound effects. The DVD also includes storyboards of a space walk sequence that was abandoned for budget reasons, and the alternate ending, with commentary by Paul W.S. Anderson. Dr. Weir shares his name with a historical figure, Johann Weyer, also known as Wier or Wierus. He was a Dutch physician, occultist, and demonologist. When Doctor Weir opens the blinds in his room during the opening sequence of the film, a whooshing sound effect can be heard. This sound effect is taken from the video game Doom, heard when the player opens a door. Some of the lost footage includes a great deal more of the Bosch-influenced Hell sequences and of the orgiastic video log that was found in the Event Horizon. This was shot by both director Paul W.S. Anderson and Vadim Jean, mainly on weekends. For his final scenes, Sam Neill would come to the studio at 3am so that he could spend 7-8 hours in make-up. Everyone's space suit has a flag showing future political changes on Earth. Characters portrayed by American actors wear a flag of the United States with 55 stars. Characters portrayed by British actors wear a European Union flag with 22 stars. Sam Neill's character wears an Australian flag with the Aboriginal flag in place of the Union Flag. The model of the Event Horizon includes a complete "X-Wing" from Star Wars as part of an antenna array. The model is visible on the lower portion of the Event Horizon during the first flyby by the Lewis & Clark. When the Lewis and Clark first docks with the Event Horizon, the number of the main airlock is briefly visible: 13. Paul W.S. Anderson had originally hired British band Orbital to compose the music for the film because he had wanted to work with them since his directorial debut Mortal Kombat which had featured their music. Paramount executives balked at the idea of hiring unknowns to write music for a big budget film, Anderson then thought of Michael Kamen and the idea of "marrying" their sounds (orchestral and techno) together resulted in the film's final soundtrack. Andrew Kevin Walker wrote an uncredited draft of the script. Some of it ended up on screen, and one sequence was cut from the theatrical cut, where captain Miller, upon entering the Event Horizon, finds a ripped-out tooth floating around. Other scenes appear on the Special Collector's Edition, when Laurence Fishburne's crew is introduced for the first time on another rescue mission. In the DVD commentary, director Paul W.S. Anderson said he regretted deleting the scene, but it didn't help the film's pace. The hundreds of apparent metal bolts that line the corridors of the Event Horizon are actually power transistors in a TO-3 or similar package. This can be best seen when Miller rests his head against the wall when hearing Corrick's voice. The rotational shot of the space station over earth took nearly a third of the film's budget. The FBFX created costumes of John Mollo's original space suit designs included many practical features such as an integrated filter blower system in the bottom of the portable life support system (backpack) into the helmet to keep the visor clear and the actor cool, thousands of LEDs that pulsated rhythmically to indicate life support functionality (with a secret 'panic mode' switch to quicken the pace when the plot required it!) and industrial magnets embedded in the soles of the boots to add to the realism of scenes featuring active magnetic boots. Paramount eschewed the overused special effects houses ILM and DreamWorks in favour of smaller studios to keep costs down. Instead they opted for Mass Illusion Cinesite (Europe) and the Computer Film Company in London. Filming occupied seven soundstages at Pinewood Studios outside London. Stanley Kubrick's Eyes Wide Shut was being filmed on adjacent soundstages. Post-production was cut from 6 weeks to 4 weeks after Paul W.S. Anderson promised to deliver the film in time for release in August 1997. Production designer Joseph Bennett had to find a crew in Britain that could build and finish the sets in 4 weeks, before shooting began. According to the DVD commentary, sequences deleted from the "Visions of Hell" include orgies and sadomasochism killing the Event Horizon's original crew. One of the members of the original Event Horizon crew was British director Gary Sinyor, who directed The Bachelor starring Chris O'Donnell and Academy Award winner Renée Zellweger. The working title was "The Stars My Destination". In keeping with the naturalistic science fiction tone of the film, the costumes were based on present day flight suits. Paul W.S. Anderson was offered the movie on the strength of the box office success of his previous film, Mortal Kombat. It meant he had to turn down the opportunity to direct X-Men, The X Files and Alien: Resurrection. The first person signed to the film was director of photography Adrian Biddle. Joely Richardson's character was originally written for a man. However, during auditions, director Paul W.S. Anderson had the part read by both men and women. He chose Richardson because of the 'British stage class' that she would bring to the movie, and thought it would be fun to then "douche her with gallons of blood". Paramount didn't officially greenlight the film until 10 weeks before production was due to begin. This meant that the production design was unnecessarily rushed and was the reason why many leading production designers turned the film down. Having just done a PG-13 movie, Mortal Kombat, Paul W.S. Anderson was very keen to do something more adult and gruesome. This was why he turned down the chance to direct X-Men. Writer Philip Eisner visited the set while the space suit sequences were being filmed. The suits were so heavy that the actors risked back injuries, prompting Laurence Fishburne to stop between takes, point at Eisner, and shout mock-angrily: "You! You Eisner! You did this to me!". Paul W.S. Anderson's initial rough cut submitted to the MPAA received the kiss-of-death NC-17 rating. The shot where Sam Neill stares out of a window which then pulls back to reveal he's on the deck of a spaceship orbiting Earth took the digital special effects house Cinesite 10 weeks to achieve. The shot lasts for 45 seconds. Paul W.S. Anderson chose not to direct Mortal Kombat: Annihilation to work on this film. The actors were stimulated to invent a back story for their characters.